The poem, a famous one, dates from June 1797 and was published in the Musenalmanach für das Jahr 1798. Schiller was similar to Shakespeare in that inventing stories from scratch was not his strong point—thus the incidents described in many of the Schiller ballads are taken and elaborated from real historical sources (whether these were true or accurate or not is another matter). The story of a handsome knight (who here keeps his name—Delorges) who picks up a glove from a lion’s cage at the behest of his fair lady—only then to reject her—comes from an eighteenth-century history: Essais historiques sur Paris (1759) by Germain François Poullain de Saint-Foix. The incident was said to have taken place during the reign of François I (thus König Franz in Schiller’s verse), roughly contemporary with England’s Henry VIII. 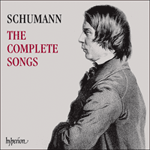 Eric Sams, notoriously hard on the late Schumann songs, admires Der Handschuh without reservation: ‘It is difficult to think of a better setting of a Schiller ballad in the whole literature of song.’ Sams argues that a work that is officially dated April 1850 may date back to 1840 when the composer was working on his ballad Belsatzar. The poem is mentioned in Schumann’s letters as early as 1834. Sams believes it to be a possibility that Der Handschuh was merely prepared for publication in 1850 when a few changes were made to the work, not necessarily to its advantage. Whatever the truth of this theory Der Handschuh hardly seems typical of the 1840 songs—it lacks a tune of any kind and the piano-writing is sparse and economical with little sign of lyricism. It is true that the subject-matter of this ballad is somewhat similar to the Chamisso poem Die Löwenbraut but that song boasts tranches of melody punctuated with significant melodic piano interludes that are nowhere to be found here. Der Handschuh is an exercise in the kind of Schumannian recitative we associate with the later songs. The marking is Mit durchaus freiem Vortrag (to be performed freely throughout)—a direction that enables the singer to adapt phrases to approximate the naturalness of speech. The irregularity of the poem and its constantly changing rhyme scheme discourage any sense of musical symmetry; this is partly to do with Schiller’s skill in keeping the listener on his toes throughout. There is much that cannot be predicted in this scene—the king’s whims in bringing the animals into the arena, the behaviour of the dangerous beasts themselves, the way in which the lady Kunigunde takes it into her head to risk the life of someone who loves her simply for amusement or to feed her vanity. And the biggest coup de théâtre—when Delorges throws the glove in the face of his lady and walks away—is merely the climax of a roller-coaster of unlikely events. Delorges of course could easily have been killed in his attempt to rescue the glove and the listener is never allowed to feel in any way certain that this will not happen. Schiller was roundly criticized at the time for making the knight behave in such an ungallant manner to Kunigunde—surely, it was argued, a knight in sixteenth-century France would never have been so rude as to throw a glove into a lady’s face. For the accompanist who has to follow this train of events there is a similar sense of effort in trying to keep together with the singer who, in telling this story, moves hither and thither in mercurial fashion, a law unto himself. The music is notated conventionally enough in common time at either end of the ballad with a central panel in 6/8; but the listener—carried along by the urgent intensity of the story, and if not looking at the music—has a hard time in working out where the bars lines actually occur. The ballad opens in a majestic D major. The pomp and ceremony of King François are signified by the suggestion of a fanfare at the beginning. Mention of his name (‘Franz’) occasions a genuflection in the subdominant, a plagal colouring to remind us that absolute monarchs are by God anointed. The beginning of fun and games in the menagerie occasions a change of key-signature and the animal cage is opened to the sound of a rising arpeggio in B flat major. The appearance of the lion is described in music that emphasizes his size with elongated note values (on ‘Löwe’ for example) and majestic cadences (‘legt sich nieder’). Terse staccato chords in quavers underline the contrast between the great beast’s yawn and his ability to strike down any interloper with the sharpest of claws. A wave of the king’s hand now brings the tiger into the arena; the animals have all been caged separately and it is the king’s pleasure to see how they will react when brought together—it might be fun after all to see them tear each other apart. 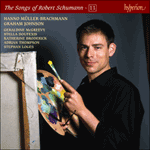 Schumann’s word-setting and accompaniment concentrate here on wide leaps in both the vocal and piano writing. The tiger is leaner than the lion, more tightly coiled, less bulky and regal perhaps but just as unpredictably dangerous. The arc traced in the air by his tail is reflected in the music’s wide-ranging intervals. We hear him roar and lick his chops. The seemingly arbitrary rests in the vocal line make for disorienting gaps in the music that generate a mood of tension and unease. The entrance of the two leopards ups the ante and Schumann turns the rhythmic screws with a change to 6/8, a metre that has a little more prance and bounce to it. The most recently introduced animals make a rush for the tiger which shows them its sharp claws. Schumann depicts this incident in rather playful semiquavers; it is difficult after all to tell when duelling cats are genuinely angry or merely playing, and this is a composer who has clearly closely observed the behaviour of the domesticated cat. The lion disdains to get involved with such strenuous activity and contents himself with an ominous growl. The animals lie down in uneasy truce, but Schiller does not forget to remind us that these big cats, perhaps deliberately starved for the occasion, are ready at any moment for slaughter. There is now a change of scene and the key-signature abandons the flats in favour of a pair of sharps. We find ourselves back in the royal box and music of a refinement fit for fair ladies and noble gentlemen. The beauty of the hand that owns the glove is emphasized (perhaps ironically) with a high note for ‘schöner Hand’. The gap between the two phrases ‘Zwischen den Tiger’ and ‘und den Leu’n’ enables us to make a space in our imagination for the exact location of the thrown glove. When Kunigunde speaks her challenge Schumann goes in for a subtle piece of character assassination: she is made to appear superficial and vain, one of those courtiers who is bored with life and forever seeking new sensations at whatever cost to others. Her music trips and lisps and flits, the staccato articulation of ‘hebt mir den Handschuh auf’ renders her a distant cousin of the empty-headed actress Philine. She is beautiful but not very nice, and Schumann’s music somehow suggests this duality. Without any fuss or prevarication (and this sang-froid is the whole point of the story) Delorges enters the arena; the high note ascent of ‘furchtbaren’ and the gruesome diminished seventh chord of ‘Zwinger’ registers the courtiers horrified reaction, not his own. We hear the confidence of his manly footfall (‘Mit festem Schritte’); the thickness of the chordal writing of ‘Ungeheuer Mitte’ suggests a body of dangerous animals clustered together, and the staccato of ‘keckem Finger’ illustrates the deft and precise manner in which the glove is picked up, Delorge’s elegantly placed hand (with no sign of a shake) narrowly avoiding touching the animals on either side of it. We now return to D major, to common time and the mood of the opening (Tempo wie zu Anfang). There is jubilation all around from the high and mighty who have observed this act of rash bravery and, in an ascending D major arpeggio the fair lady who has thrown the glove casts her lovestruck gaze (‘mit zärtlichem Liebesblick’)—a phrase that Schumann successfully inflects with eyelash-fluttering insincerity. The final six bars of the ballad are wonderfully peremptory. The glove is thrown back in Kunigunde’s face and the phrase ‘Den Dank, Dame, begehr ich nicht’ is a superb display of mock gallantry, the dips in the vocal line suggesting the ironic and bitter courtesy of an exaggerated bow. This is the ultra-courtesy that is meant to convey only contempt. The knight simply walks off the set of the whole terrible charade leaving his lover (and one suspects his career as a courtier) behind him. There is no postlude and the music comes to a complete halt with the last of Schiller’s narrative words—all to marvellous effect. There are a number of ballads when cruel tyrants command deeds of daring and sacrifice (notably in Schiller’s famous ballad, set to music by Schubert, Der Taucher), but men are nasty beasts and are expected to behave in such a fashion. By engaging in this kind of cruel game Kunigunde has broken all the rules for women in the courtly love tradition; instead of fainting and weeping and expiring in faithful devotion she has toyed with the life of Delorges and shown exactly how shallow her feelings are for him. In defying that convention she frees Delorges in turn to defy the convention of perpetual masculine service and gallantry. Schumann would have regarded the tale as salutary: he would have believed that women had responsibilities of care in return for the devotion of their men-folk, and we can be sure that he thanked his lucky stars that in his Clara he was spared a spoiled and demanding wife. Or rather, even if she was demanding (and she could be) it was not as a result of cruel superficiality. Arrangée à l’origine pour chœur, cette longue ballade est la première des trois œuvres qu’il compose sur des textes de Schiller, et de loin la plus importante. Il est probable que l’expérience du travail sur l’opéra Genoveva avait accru l’intérêt qu’il portait à la poésie courtoise de ce genre et de cette époque. C’est une réussite considérable et une rupture importante par rapport à son style mélodique du point de vue du récitatif continuel—l’influence du jeune Wagner est également perceptible. Diese erweiterte Ballade war ursprünglich ein Chorarrangement und ist die erste und bei weitem bedeutendste von Schumanns drei Schiller-Vertonungen. Wahrscheinlich hat die Arbeit an der Oper Genoveva sein Interesse für höfische Dichtung dieser Art und Zeit gesteigert. Dies ist eine beträchtliche Leistung und eine massive Abkehr von seinem melodischen Stil des fortlaufenden Rezitativs. Auch der Einfluss des jungen Wagner wird erkennbar. By a fair circle of ladies. Spewing out two leopards at once. The savage cats crouch down. As calmly he returns with the glove. And forthwith takes his leave.